LOOSE AND LEAFY in DORSET: SPRING AND AUTUMN - CAN WE TELL THE DIFFERENCE? Always, at this time of year, I go looking for what's left of autumn. 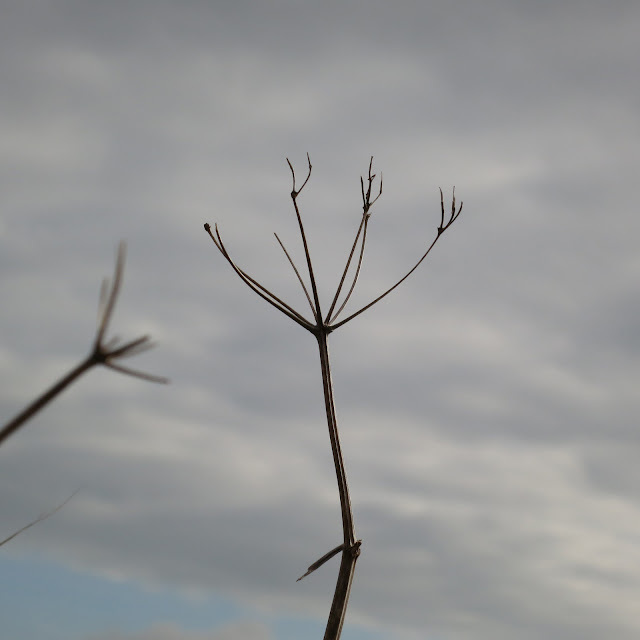 Usually, this means taking photos of leaves which have survived the winter, disintegrated flowers that never fell. That kind of thing. It's my version of spring cleaning. I'd previously thought of dessicated blackberries as the fruits summer forgot. 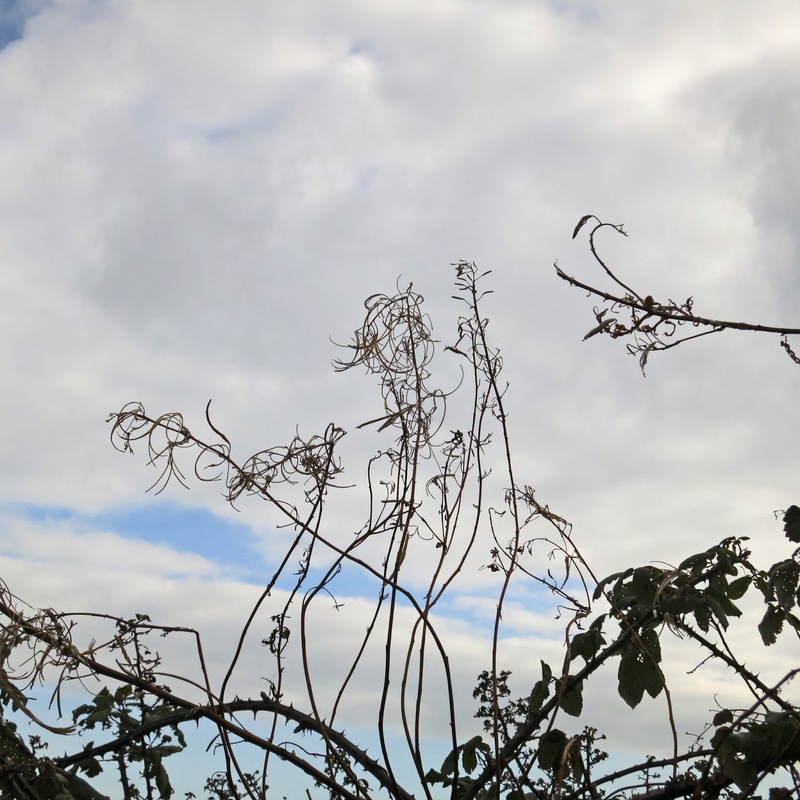 I'd seen old willow herb shapes as just that - shapes left from when seeds fell. 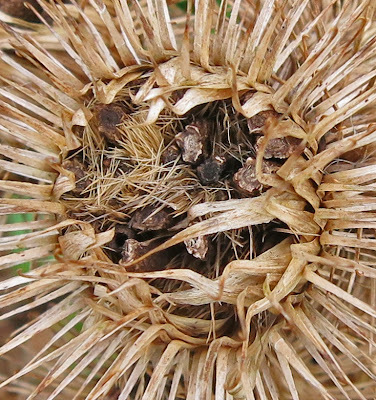 Now, now, I see them as the winter's hoard - not for birds to eat, though with some, like teasels, this is indeed a side effect, but as plant's packets of seeds, ready to sow in the spring - and they've begun sowing. This should not have been as much a revelation as it was. But that's the advantage of being ignorant. The pleasure when one's eyes open is immense. 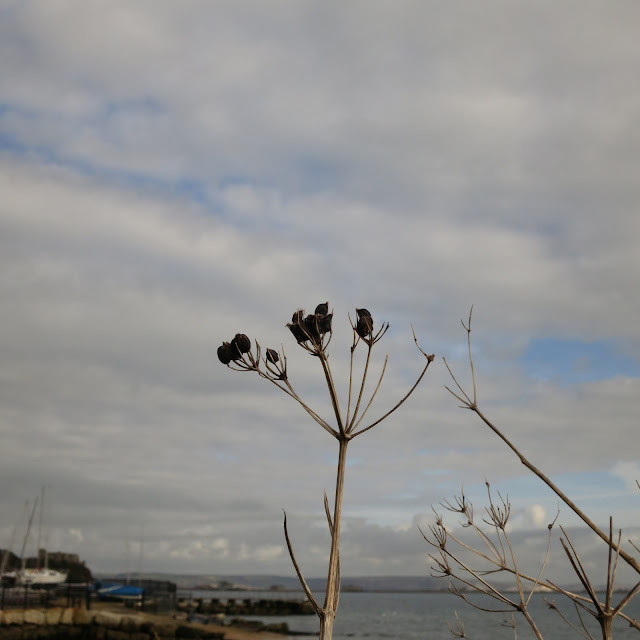 Some Alexanders still have seeds in reserve. Others have let them all go. Old Man's Beard (wild clematis) tends to look pretty euchy by now. The deliciously white fluff of autumn has turned into dirty gray drifts of ancient cotton wool - the kind left behind by the dustmen. But, kept safe in the mess, the seeds are opening and dropping. They are tiny. Smaller than tomato pips. 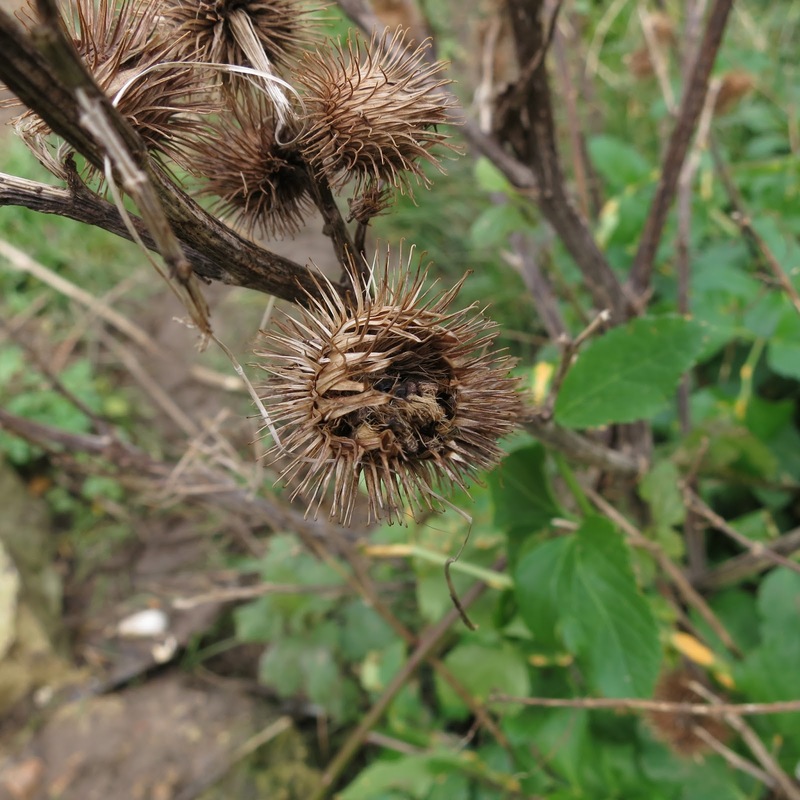 And prickly balls of burdock are opening to release theirs. See them? Quite large and lumpy inside. Isn't autumn wonderful to save some of itself for spring? Last year's post looking at the year before's leaves. some lovely shapes here - i must look out for some old man;s beard - just had mine trimmed last week! 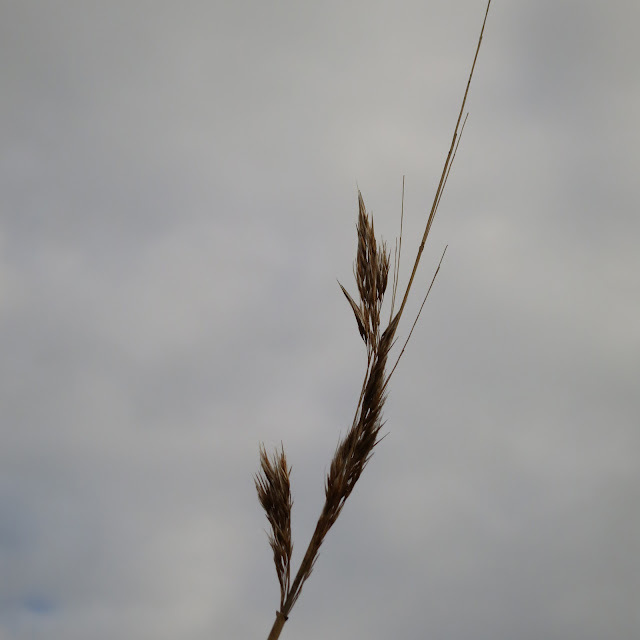 Nature is very clever at hanging onto things until they are needed. Hello Toffeeapple, Mark and Gaz - all your comments - exactly. The spiky ones like Burdock are presumably like that in order to deter predators taking the whole lot all in one go - so retaining at least some of the seeds for the following year. Hello Gerald. 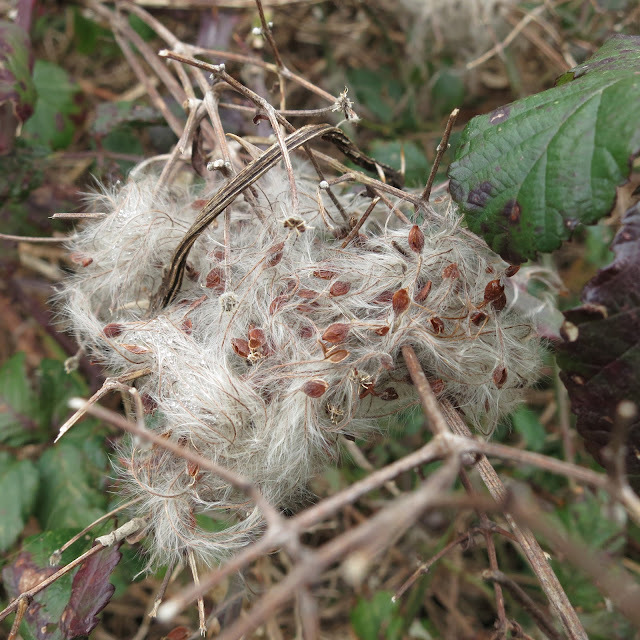 I have never noticed before how prickly these tiny Old Man's Beard seeds are, nor that they burst open like this. Hello Mark. I imagine you are right. It's interesting how easily they fall our now if you tip and shake - and how big they are. 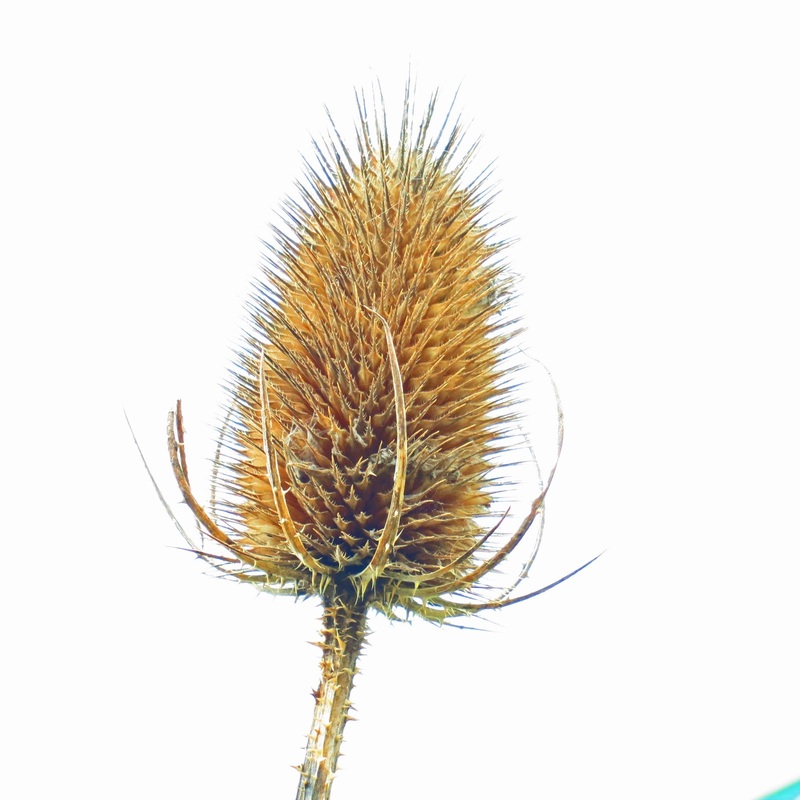 Teasel seeds (smaller) come down in a shower when you touch the plant. Hi, Pearl, heavy the sky, isn't it? In summer, this area is a holiday destination. In winter there are few tourists. You can see why! 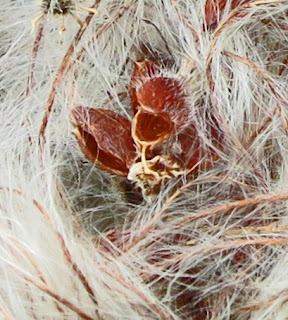 Such beautiful images especially the old man's beard, those seeds are amazing. Yet again you have reminded me to look more closely at things! Thanks Sarah. It's interesting that you pick out the Old Man's Beard. I find the fluff and the seeds interesting (very interesting! )but not necessarily beautiful. Terrific photos showing, and telling, an interesting aspect. I love to photograph all those seedheads in the wintertime too. Nature certainly has beauty in decay. Morning, Rosie. 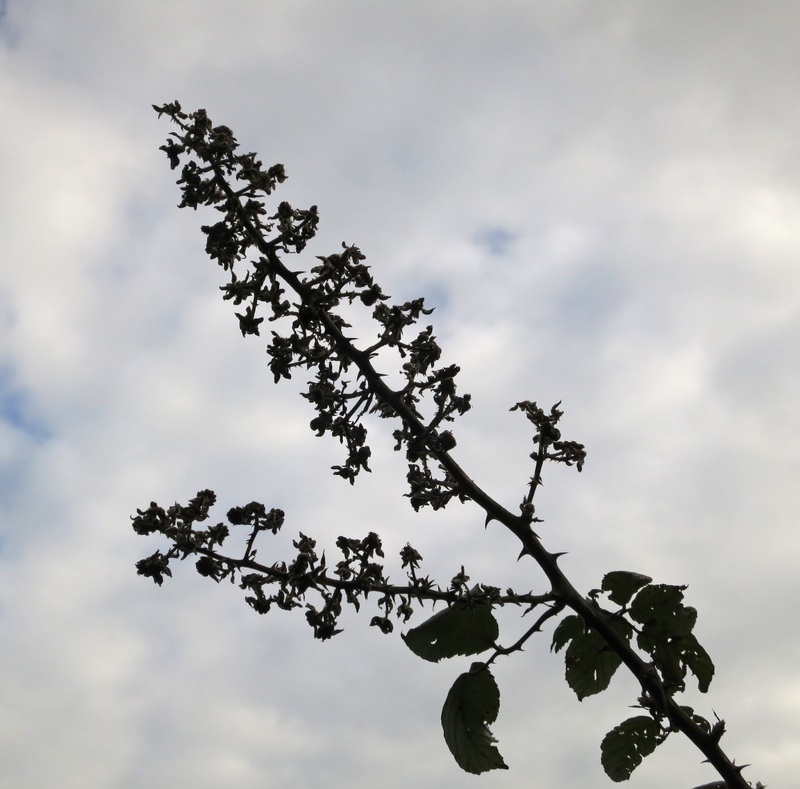 It's non-stop change, isn't it, despite the repetitive nature of the seasons there's always something new to see, whether it's something we've never seen before or never before seen that way. A grand thought Lucy...I had some birds foraging for those autumn seeds today...how wonderful. I have often thought that spring and autumn look so similar except for the autumn leaves and snow...once both are gone I cannot tell the difference for quite a while. I always enjoy seeing your world through your lens....it's beautiful. In winter when it's to be expected stark, in spring it's green....you always manage to find something interesting for us to see. So many different textures and colors! Very nice. Thanks for the close-up views! how did you achieve that teasel photo?